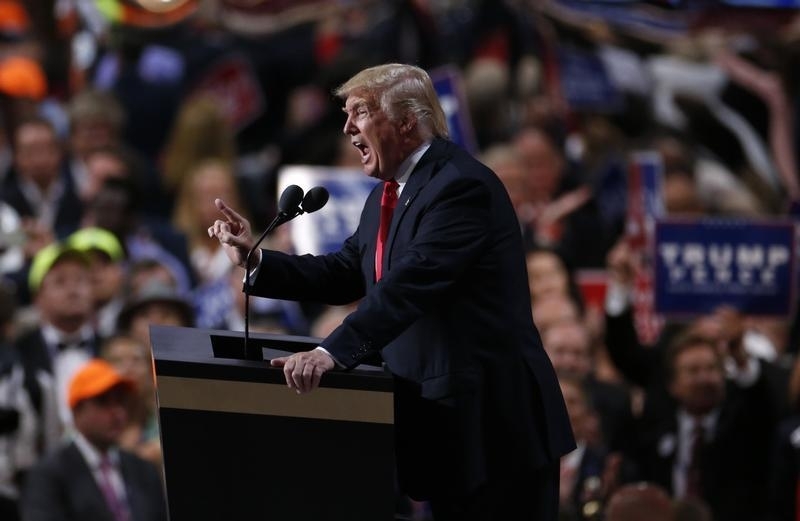 Cleveland - Despite promising “the truth, and nothing else” in his convention speech, Donald Trump presented the nation with a series of previously debunked claims and some new ones Thursday night — about the U.S. tax burden, the perils facing police, Hillary Clinton’s record and more. THE FACTS: A rollback? President Barack Obama has actually achieved some big increases in spending for state and local law enforcement, including billions in grants provided through the 2009 stimulus. While FBI crime statistics for 2015 are not yet available, Trump’s claim about rising homicides appears to come from a Washington Post analysis published in January. While Trump accurately quotes part of the analysis, he omits that the statistical jump was so large because homicides are still very low by historical standards. In the 50 cities cited by the Post, for example, half as many people were killed last year as in 1991. THE FACTS: The pace of releasing immigrants is driven not by the Obama administration, but by a court ruling. A federal judge ruled last year that the government couldn’t hold parents and children in jail for more than 20 days. An appeals court partially rolled that back earlier this month, saying that parents could be detained but children must be released. By the standard used by the government to estimate illegal border crossings - the number of arrests — Trump is right that the number in this budget year has already exceeded last year’s total. But it’s down from 2014. THE FACTS: Clinton’s use of a private server to store her emails was not illegal under federal law. Her actions were not established as a crime. The FBI investigated the matter and its role was to advise the Justice Department whether to bring charges against her based on what it found. FBI Director James Comey declined to refer the case for criminal prosecution to the Justice Department, instead accusing Clinton of extreme carelessness. As for Trump’s claim that Clinton faces no consequence, that may be true in a legal sense. But the matter has been a distraction to her campaign and fed into public perceptions that she can’t be trusted. The election will test whether she has paid a price politically. THE FACTS: Not according to the National Law Enforcement Officers Memorial Fund, which tracks police fatalities daily. The group found that the number of police officers who died as of July 20 is up just slightly this year, at 67, compared with 62 through the same period last year. That includes deaths in the line of duty from all causes, including traffic fatalities. It is true that there has been a spike in police deaths from intentional shootings, 32 this year compared with 18 last year, largely attributable to the recent mass shootings in Dallas and Baton Rouge. But that was not his claim. And overall, police are statistically safer on America’s streets now than at any time in recent decades. For example, the 109 law enforcement fatalities in 2013 were the lowest since 1956. THE FACTS: Trump persists in making the bogus claim that the U.S. doesn’t screen refugees. The administration both screens them and knows where they are from. The Department of Homeland Security leads the process, which involves rigorous background checks. Processing of a refugee can take 18 months to two years, and usually longer for those coming from Syria. Refugees are also subject to in-person interviews and fingerprint and other biometric screening. THE FACTS: Trump is playing with numbers to make the economy look worse than it actually is. The sluggish recovery over the past seven years has been frustrating. But with unemployment at 4.9 percent, the situation isn’t as bleak as he suggests. Trump’s figure of 14 million who’ve stopped working since Obama took office comes from the Labor Department’s measure of people not in the workforce. It’s misleading for three reasons: The U.S. population has increased in that time; the country has aged and people have retired; and younger people are staying in school longer for college and advanced degrees, so they’re not in the labor force, either. A better figure is labor force participation — the share of people with jobs or who are searching for work. That figure has declined from 65.7 percent when Obama took office to 62.7 percent now. Part of that decrease reflects retirements, but the decline is also a long-term trend. On national debt, economists say a more meaningful measure than dollars is the share of the overall economy taken up by the debt. By that measure, the debt rose 36 percent under Obama (rather than doubling). That’s roughly the same as what occurred under Republican President George W. Bush. The Hispanic population has risen since Obama while the poverty rate has fallen. The Pew Research Center found that 23.5 percent of the country’s 55.3 million Latinos live in poverty, compared with 24.7 percent in 2010. THE FACTS: Trump’s reference is to a threat by Obama for retaliatory strikes if Syrian President Bashar Assad used chemical weapons against rebels — and he’s basically on target. When Assad crossed Obama’s “red line” in 2013 by using chemical weapons, the U.S. president backed down. Obama’s two secretaries of state, Hillary Clinton and John Kerry, pushed for intervention, as have a former defense secretary and CIA director. But Obama as commander-in-chief has the last word, and nothing has swayed him thus far. THE FACTS: That’s a somewhat overheated take on a legitimately troublesome issue for Clinton. Although financial disclosures show she earned only her government salary as secretary of state, she made more than $21 million afterward, over three years, for speeches and appearances for private companies. None of those speeches was paid for by foreign governments, but some groups she addressed could be counted as special interests. As well, the Clintons’ family charity, the Clinton Foundation, received millions of dollars in donations while she was secretary of state, some from foreigners. And Bill Clinton earned millions making appearances and speeches for foreign corporations and organizations while his wife was at the State Department. She did not start the war in Libya, but supported a NATO intervention well after violence broke out between rebels and the forces of dictator Moammar Gadhafi. The country slid into chaos after Gadhafi was ousted and killed in 2011, leaving it split between competing governments. Clinton had no role in military decisions made during the 2012 attack on the U.S. diplomatic post in Benghazi, Libya, that killed U.S. Ambassador Chris Stevens and three other Americans. Republicans’ claim that high-level officials in Washington issued a “stand-down” order delaying a military rescue in Benghazi has been widely debunked. On Iraq, Clinton as a senator voted in 2002 to grant President George W. Bush authority to invade Iraq, but has since said it was a “mistake.” Many in the Middle East do not regret Saddam’s ouster and regional allies allowed U.S. bases in their country to support the war. But many also now fear the Islamic State group, which rose in the chaos of Syria’s civil war and Iraq’s security vacuum. THE FACTS: Trump continues to repeat this inaccuracy. The U.S. tax burden is actually the fourth lowest among the 34 developed and large emerging-market economies that make up the Organization for Economic Cooperation and Development. Taxes made up 26 percent of the total U.S. economy in 2014, according to the OECD. That’s far below Sweden’s tax burden of 42.7 percent, Britain’s 32.6 percent or Germany’s 36.1 percent. Only three OECD members had a lower figure than the U.S.: Chile, South Korea and Mexico. Hillary Clinton is a liar, but Donald is worse. Trump's a liar. It should be plain and simple by now. His earpiece wasn't working by David Duke question, he didn't pose as his own spokesperson in the 1980's and Melania was just using "common" words. He takes Americans for fools and unfortunately it appears that he is right on that. NY Times also did fact checking and said he was generally accurate. I love the title. It says "debunked" and he goes on to pretty much agree with what Trump said with some minor inconsistencies. Trump says 25 years and he writes since 1991. That's 25 years in my book. I can go on but you get the point. TRump and his supporters don't care about facts. looks like Mussolini has finally arrived in America. Vote for an unhinged demagogue? never ! I just read the Times article and it did NOT say "he was generally accurate" about the specific topics mentioned in the piece above. In fact, the Times piece noted just about all the same lies and misstatements as the above article. It seems you're, ahem, a little bit of a liar yourself, Pashuteh. “ Another stupid AP story. Oh I get it. "Stupid story" is defined as any news report that doesn't pander to your personal view of the world.